Kansas City, MO--Since its release in June 2015, the Purifier® Axiom® —a Class II, Type C1 biological safety cabinet that can function in either Type A or Type B mode—has made waves in laboratory spaces across the country (like this one at Creighton University). Now, this Type C1 cabinet has been named as one of 100 finalists for the 2016 R&D Awards, an annual event that honors the most innovative technologies of the year. The list of finalists for what is sometimes called the "Oscars of Innovation" is compiled by over 50 independent judges, many hailing from leading national laboratories and top R&D companies. The selection process is stringent, and the list of finalists includes heavy hitters such as Dow Oil, Gas and Mining, General Motors Research and Development Center, Agilent Technologies and many more. The Axiom was recognized in the Mechanical Devices/Materials category. The full list of categories for the 54th annual R&D 100 Awards includes Software/Services, IT/Electrical and Green Tech, and many others. Winners in all categories will be announced at a gala to be held November 3 in Washington D.C.
Until now, microbiological laboratories have had to choose between Class II, Type A2 or Class II, Type B2 biosafety cabinets to meet their personnel, product and environmental protection needs. While application and protection considerations have not changed, something else has—the options for selecting a cabinet. Because the Axiom is an entirely new type of Class II biosafety cabinet, it can function in either Type A or Type B mode, saving money, time and energy in the process. Wondering what makes it work? It has a lot to do with airflow—and a lot do with the perseverance of the team of user-first designers and engineers at Labconco. Senior Products Engineer Jim Hunter and Product Manager Brian Garrett, two of the brains behind what's been appropriately dubbed the BSC no-brainer, have spoken in the past about the challenges of developing an entirely new type of biosafety cabinet. Since R&D's list of finalists was released in August of 2016, though, they've had to prepare an altogether new type of statement: one of acknowledgement of their team's success. 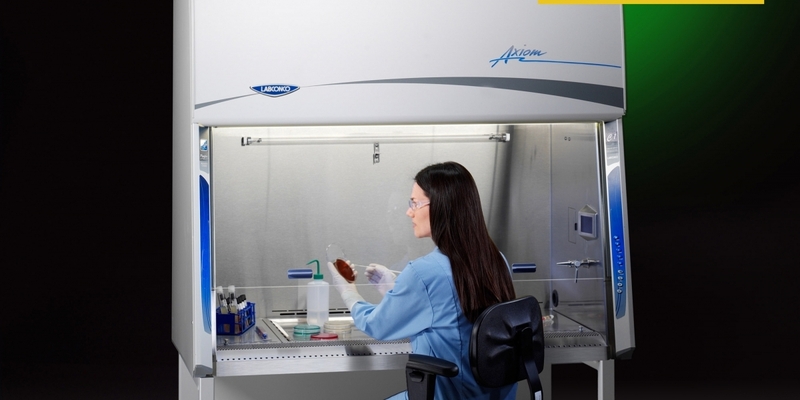 "The Axiom challenges many of the preconceptions of what a biosafety cabinet should be; it is far more flexible in its installation, either connected to an exhaust system or not," Hunter said. "And, for the first time, the BSC takes an active role in protecting the user, even in the event of an exhaust system failure." Garrett added that the goal of the project was to add flexibility to laboratory spaces while increasing safety in the industry for scientists doing all kinds of important work in the field. "It's an incredibly big deal to be going up against the gorillas of innovation and invention in our space, and we're proud of what our team was able to accomplish," he said.